TED Tips – Issue 2: What is the difference between a Learning Management System (LMS) and a Digital Learning Environment (DLE)? Almost every university uses a learning management system (LMS). Think of a learning management system as the software infrastructure or the online website that delivers the “stuff” of a particular course. An LMS can be used to present content, provide information, and manage administrative duties. It may be helpful at tracking enrollments, attendance and grades. The approach of an LMS often emphasizes technology – it is a “management” system. What a Learning Management System does not often emphasize is facilitating learning. In contrast, there is another approach, a “Digital Learning Environment” (DLE). This approach is also known as “The Next Generation Digital Learning Environment” (NGDLE). The scope no longer contains a single application – but an ecosystem that supports higher education. Multiple technologies and services meet a variety of learning needs with a greater emphasis on flexibility. It should be less a “one size fits all” but a set of tools based on common standards. 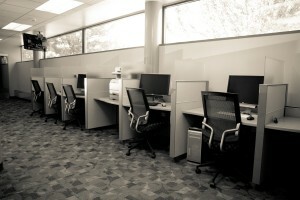 The University of Wisconsin System is also moving away from an LMS and towards a DLE. 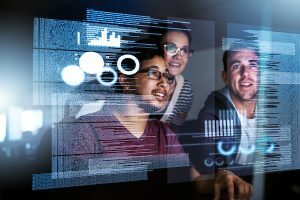 The approach should be against the implementation of a required technology solution, but more in favor of creating a flexible set of services and tools that support teaching and learning. This allows the UW system to integrate tools through a common platform while creating and easy point of entry, a secure sign-on leveraging our “federated” identity, and services that communicate to each other while ensuring appropriate security and privacy. Instructors will have the freedom to apply these tools to their teaching to support their students learning. next generation digital learning can take many forms. Underlying this belief are five key characteristics that define the UW System Digital Learning Environment. I will explore these characteristics in more detail in the coming weeks as part of this blog. For now, I want to introduce the characteristics as the drivers behind the project. Accessibility and the principles of universal design are fundamental, so that all students, regardless of ability and learning preference, can succeed in all instructional modes. Provides a platform to support learning and administrative analytics, readiness and learning assessment, progress mapping, advising, and “early alerts” to trigger interventions to ensure student success. Collaboration is expected, encouraged, and supported among those within and outside the institution. Components are interoperable; meaning they are standards-based and work together seamlessly, not stapled together to sit side-by-side. The environment is student-centered, and allows for a personalized experience for the student with regard to both content and pathways. Within this Digital Learning Environment, a platform presents content. The University of Wisconsin System has chosen Canvas Instructure as that main platform. Canvas is envisioned as the main tool “hub.” The emphasis is on creating a seamless, consistent, and accessible student experience. Canvas integrates additional tools and services. Tools and services are currently being evaluated for inclusion and integration within this environment. In summary, a Digital Learning Environment (DLE) emphasizes pedagogy that then allows for the adoption of technology that supports teaching and learning. Instead of being a single monolithic technology, you can personalize instruction through the set of tools and services to meet your course needs. A DLE supports face-to-face and online courses. This approach imagines The Next Generation Digital Learning Environment as both an ecosystem and a mind-set. The DLE supports accessibility, analytics, collaboration, interoperability, in a personalized experience. Next Week: What is the status of the Canvas migration project here at the University of Wisconsin Whitewater? The D2L eGrading process is now available for the Spring 2018 semester. This process allows instructors to transfer final grades from their Desire2Learn Gradebook directly to their WINS Grade Roster. If you prefer step by step documentation, that can be found at: WINS eGrading Overview. If you have any questions or concerns with the eGrading process, please contact UW-W Desire2Learn Support. Technologists at DoIT in Madison will be performing scheduled infrastructure maintenance impacting Desire2Learn on four occasions in the coming month. It is worth noting that three of these are during regular maintenance windows, while the other is on a Sunday morning. During these times, Desire2Learn will not be available. Access will be restored as soon as possible after the work has been completed. As you are working on and preparing your Winterim courses, please adjust your course assignments and due dates accordingly. If you have any questions or concerns about this outage, please contact UW-W D2L Support. The Learning Technology Center (LTC) is offering an all day Saturday event on December 9th, focusing on instructional development! This event is a great opportunity for instructors who are not able to contact the LTC during our standard operating hours to receive D2L assistance. Join us at the LTC office, in McGraw 120, as early as 8:00am for D2L one-on-one support that is focused on your specific D2L needs. We are also offering two sessions of D2L basics, which may include information such as how to set up LockDown Browser, upload test questions, transfer grades to WINS, and much more! If you are not able to make it to campus, no problem! You can schedule a one-on-one WebEx meeting during the 1:1 appointment times listed below. To schedule a 1:1 appointment, contact the LTC after you register. Please stop by to get your questions answered, stay until your problems are solved, and close out the semester successfully! *sessions subject to change based on instructor needs. For further questions about the Saturday LTC Instructional Development Event please contact the LTC at ltc@uww.edu. To sign up, go to https://my.uww.edu/signup/Registration/Details/15325 (and log in with your Net-ID and password). Registration closes on Wednesday, December 6th! Winterim 2018 and Spring 2018 D2L course requests will soon be available in the D2L Course Request Application. Winterim 2018 requests can be placed starting Monday November 6th. Spring 2018 requests can be placed starting Monday November 13th. As a reminder, course requests for a semester become available on the first day of priority registration for students. D2L courses need to be requested every semester. If you have any questions or concerns, please contact UW-W D2L Support. Desire2Learn 10.7 Upgrade – What Happened This Summer? There was an upgrade to Desire2Learn on Thursday, June 15th and if you weren’t teaching you may have missed it. D2L received a handful of new features, and fixed a slew of outstanding issues. We are excited to share all of these with you. When creating a new Discussion Topic, there is now a “Topic Type” option. This adds the ability to create a Group or Section topic that is available to everyone, but only allows students to see threads created by users in their same group or section. 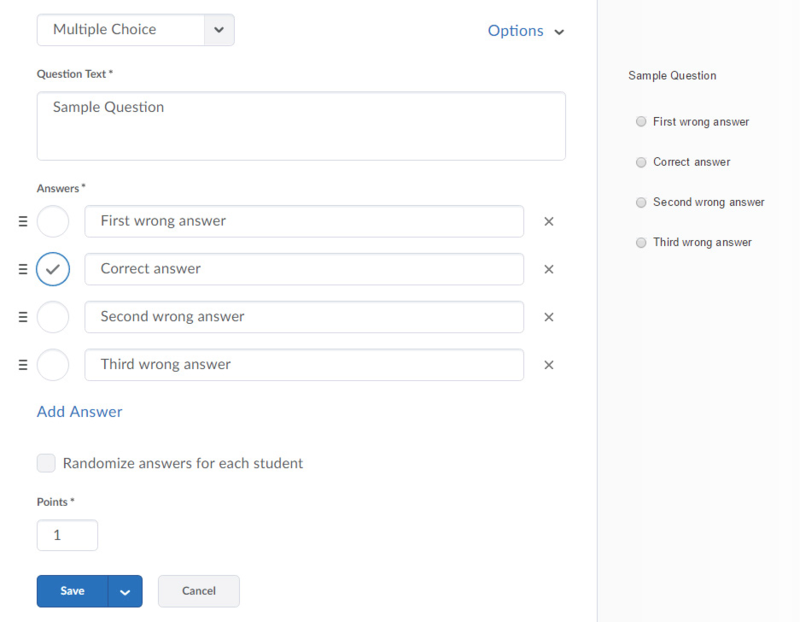 A visual redesign of the Quizzes tool to improve the usability of creating and editing Multiple Choice, True/False, Short Answer, and Long Answer questions. Instructors are able to opt out of the new change individually. Dates are now correctly set in the Turnitin side to avoid the “Error communicating with Turnitin” error. When you copy Turnitin-enabled folders into another course, you can now enable all folders at once. If you have any questions or concerns about this upgrade, please contact UW-W D2L Support. There is an upgrade to Desire2Learn scheduled to start at 9:30pm on Wednesday, June 14th and be completed by 10:30am on Thursday, June 15th. During this time, you will not be able to access Desire2Learn. Please plan your summer course work accordingly. We are in the process of creating a “What’s New?“ document and will make it available in the coming weeks. We do not foresee any more changes with this update. Fall 2016 D2L course requests are available in the D2L Course Request Application. As a reminder, course requests for a semester become available on the first day of priority registration for students, and course shells for D2L need to be requested for every semester you plan on using D2L. Turnitin services, including Originality Check, Peermark, and Grademark, may be unavailable during a scheduled maintenance period on Saturday, March 5th, 2016, from 9:00 AM to 1:00 PM (CT). During this outage window, students should not submit files to a Dropbox folder that has Turnitin enabled, and instructors should not create new Dropbox folders with Turnitin enabled. Instructors are encouraged to modify assignment due dates either before or at least several hours after the scheduled maintenance window. If possible, it’s also advised that instructors change the end date on all Dropbox folders that are utilizing Turnitin so that students won’t inadvertently submit during the outage window. Please note, any Dropbox folders in a D2L course that are currently NOT utilizing the Turnitin Originality Check, ending before the outage window, or starting after the outage window do NOT have to be altered. Summer 2016 D2L course requests are available in the D2L Course Request Application.